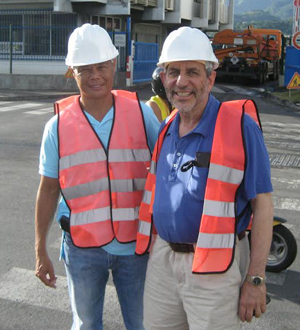 Albert Suard, project supervisor and Ancient Arts owner Mark Schoem at the Port of Papaeete, Tahiti, ready to receive the crate containing the stained glass. at Lagaronne Aluminum, Arue, Tahiti. 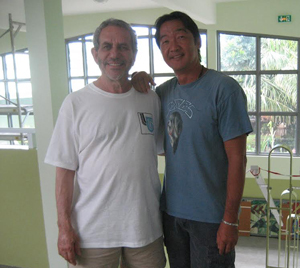 Ancient Arts owner Mark Schoem and artist Victor Lefay. Ancient Arts Stained Glass (www.ancientartsstainedglass.com) owner Mark Schoem was able to fulfill a childhood dream with a visit to Tahiti for a stained glass project at the Sacred Heart College in Taravao (Lycee Sacre-Coeur de Taravao). The project was initiated by a phone call in May of 2013. Albert Suard was the English teacher at the Sacred Heart School and was inquiring as to our interest in creating a stained glass window at the school. 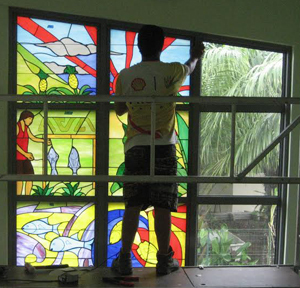 Albert asked about our experience in working in distant locations and when we told him about our Church stained glass work in American Samoa (also a Polynesian society) he felt that we would be able to handle the logistical requirements of such a project. The installation of the stained glass window was completed on May 5, 2014 and the inauguration and benediction (what we would call the dedication) took place on May the 8th. Over 700 people from all over French Polynesia attended this seven hour long event including Brothers, Priests, government officials and representatives of other Catholic schools in Tahiti. This event was widely reported in the Tahitian press and was featured in a long segment the following evening on Tahitian television (TNTV, Tahiti Nui Television). Ancient Arts owner Mark Schoem gave a short speech thanking everyone who had helped with the fulfillment of the project, including Albert, Brother Alain Celton, the school principal, and Victor Lefay, the art teacher at the school, who created the original sketch upon which the stained glass window was based. The Sacred Heart College was established by and is administered by the Brothers of Christian Instruction (Frere de la Instruction Christian or FIC). This is an international Order founded in France and based in Ploermel, Brittany. The first missionaries of the order were sent to Tahiti by the founder Fr. Jean-Marie de la Mennais who died in France in 1860 (www.ficbrothers.org/Founders.html). The great leader of the Catholic Church in Tahiti in the 20th Century was Archbishop Paul Maze. Archbishop Maze died in 1976 and is of course well remembered by the Brothers and many others of the Catholic community in Tahiti. These two leaders are pictured in the center of the window and are extremely important to the history of the Catholic Church in Tahiti and to the Lycee Sacre-Coeur. The background of the window depicts the landscape of Tahiti and some of the activities of the people as viewed from the plateau of Taravao. This beautiful landscape of mountains and ocean waters is situated at the isthmus that joins the two sections of the island, Tahiti Nui and Tahiti Iti. School and Church dignitaries gather before the Benediction of the stained glass. 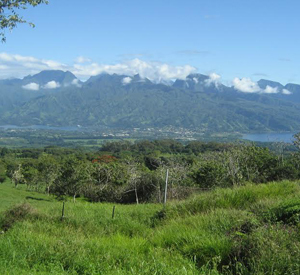 photos left to right: On the road from Matavai to Taravao, Tahiti. 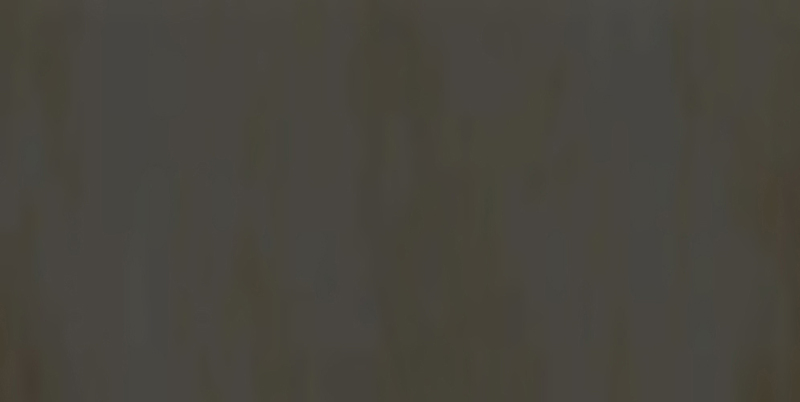 ; View from Point Venus. photos left to right: Belvedere Outlook, Moorea; Esther and Mark Schoem at Tautira, Tahiti Iti.